On Friday South Africa was dealt a devastating blow to the chest as news filtered in on the death of Mbulaeni Mulaudzi. I personally felt like I had lost one of my best friends, as Mulaudzi was one of my sporting heroes. Mulaudzi rose to prominence when he came 2nd in the African Championships held in Algeria. South Africa would soon find out that they had another special talent in the 800m category after the heroics of Hezekiel Sepeng in the 1996 Olympic Games. 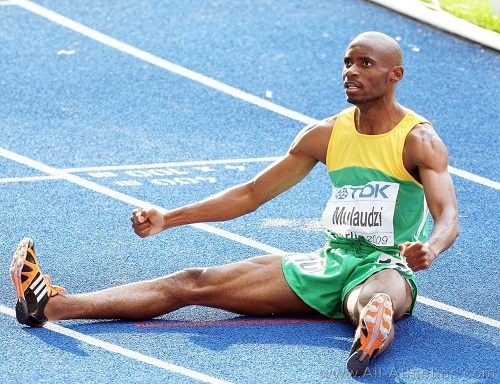 Mulaudzi then became a household name when he won gold at the 2002 Commonwealth Games in Manchester. This success was the start on a run of form that would take Mulaudzi to the top ranked position in the World in 2006, the first Black South African to hold such a position. The journey would include Gold at the World Indoor Championships and silver at the 2004 Athens Olympics. He would go on to amass 11 major tournament medals along with plenty minor tournament medals in the IAAF World Series. In the early years after 1994 there was much sport to unite South Africans. We had the Rugby World Cup in 1995, AFCON in 1996 and of course Josiah Thugwane and Penny Heyns in 1996. But a decade after our first elections as a new South Africa, Mulaudzi was a driving force in reminding our country that we are one. His success was one that I saw as a catalyst for much future success. The 2006 South African Sportsman of the Year was investing his time in the youth of South Africa in a bid to help to build future Olympians. South Africa has been robbed of a legend, but his legacy will live on and he may be the inspiration that leads young South Africans to future success.